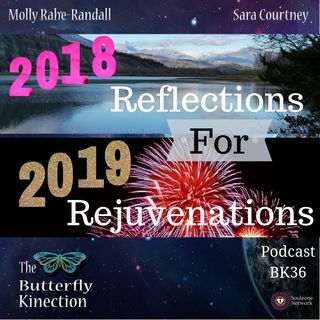 Molly and Sara discuss how reflecting on our experiences that occurred in 2018 can help us to release emotions, learn lessons and grow. Reflecting, releasing, and learning lessons can allow us to feel rejuvenated and ready to set goals in our everyday life in the new year. Sometimes it can be a challenging and overwhelming this time of year. It is easy to get lost in sad and frustrating situations. But if we try to look at our year with a different perspective, we can start to reflect on why ... See More things happened, what the bigger lessons were, and be able to see our growth in them. Molly and Sara talk about the importance of releasing any old or residual feelings that we have from the year. We need to be able to take time for self-care and reach out to friends, family and loved ones to talk about our feelings if we are feeling isolated. By releasing experiences and feelings, and reflecting on what we are thankful for, we can begin to look at the year ahead with a positive mindset. Molly and Sara share their experiences of trying to exercise self care while having children. Though it can be difficult at times, we should explain to our children why it is important to take care of ourselves. Instilling importance of self care, mindfulness, communication, and keeping soul connection is just as an important lesson to teach our children as it is ourselves. We are better people when we put ourselves first and communicate how we are feeling. We can’t be there for others in the way we would like if we don’t give ourselves a break to rejuvenate. It is important to stay true to who we are and being 100% authentic. This new year is about taking a breath to reflect and being ok with living in that moment so we can see clearly the path ahead of us.